We all know the old saying, “A picture is worth 1,000 words” – and that couldn’t be more true when it comes to real estate! Did you know that 98% if buyers start their search for a new home online? Frankly, it makes me wonder what they other 2% are doing! When a buyer hits the World Wide Web to dive into the process of home browsing they are swamped with information and most importantly, PHOTOS. While descriptions and verbiage are great additions to a listing, it’s the pictures that catch the eye of the buyer – it’s the pictures that make them want to see more – it’s the pictures that get them in the door (literally), and THAT is what brings you an offer! At The Peters Company we know this to be 100% true, which is why we would never skimp on this incredibly important marketing technique. Of course, our professional staging, accurate pricing, and overall marketing plan are great too 😉 but today we’re talking about photography! Here are a few options that we offer our sellers to provide the best opportunity to get your home sold! Professional Photography – Every listing that we market has photos taken by a PROFESSIONAL photographer. This isn’t me on my iPhone with a great filter taking quick snap shots of your living room. Photos are at the center of our marketing, so we provide this service (at no additional cost) to all of our sellers. The lighting, lenses, and quality of professional photos FAR exceeds anything we could do, and we want all of our listings to be portrayed in the very best light. 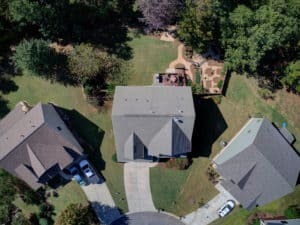 Drone/Aerial Photography – When appropriate, drone/aerial photography adds another great element to capturing the true essence of a property. For homes with pools, huge lots, and amazing views, this photography goes the extra mile in showing off the best features of a home. Talk about a “wow!” for buyers scrolling through photos when they can see – from the air – the gorgeous mountain or lake views that their new home will have! Matterport/3D Photography – Another fantastic photography element that we have recently started using is the Matterport/3D technology. 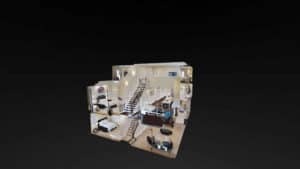 This is a 3D camera that scans an entire property and stiches all of the images together to create a virtual tour of the home. To say that it’s interesting is an understatement – it’s down right awesome! Gone are the days of buyers wondering how your home is laid out – Is there a bedroom on the main level? Where is the laundry? What’s the view from the kitchen to the living room? This new technology is on the cutting edge of marketing, and where appropriate is an excellent marketing tool for your home! Buyer can actually “walk” through your home and fall in love before their first visit! 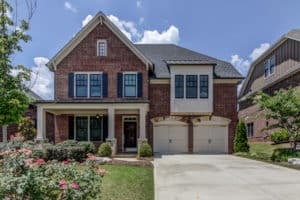 The listing team at The Peters Company wants to make your home the star of the show – and most importantly we want it to stand out amongst all of the other competition out there! Let us put our great team to work for you today! Call us today at 678-921-1470.